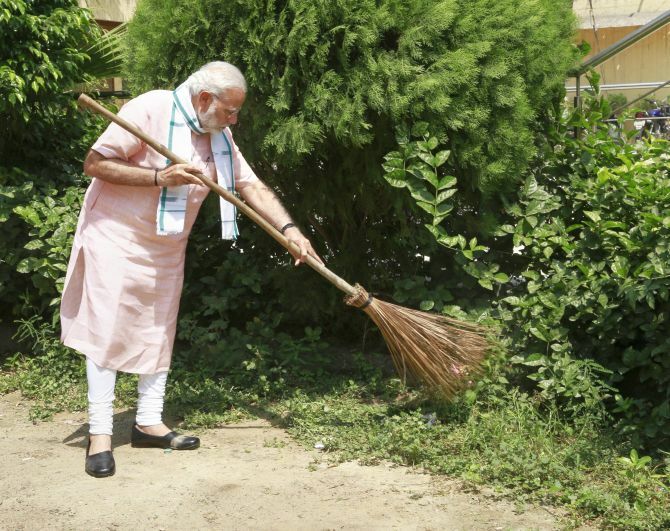 Prime Minister Narendra Modi launched Swachhata Hi Seva (cleanliness is service) campaign on Saturday and took up a broom to clean a school named after Dalit icon B R Ambedkar as ministers of his government and Bharatiya Janata Party leaders and workers participated in similar exercise across the country. 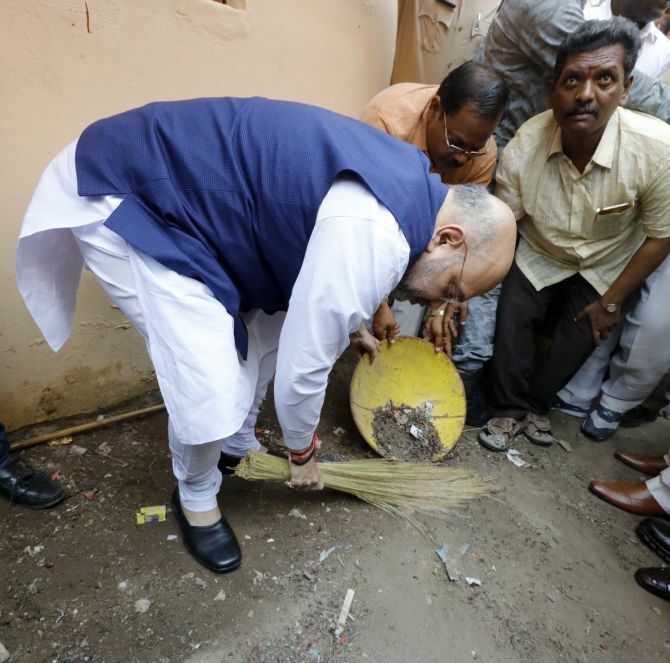 In a nearly-two-hour video interaction with people from across the country, including faith leaders, Uttar Pradesh Chief minister Yogi Adityanath and noted personalities such as Amitabh Bachchan and Ratan Tata, Modi said the sanitation coverage in India has increased to over 90 per cent from 40 per cent in the four years of Swachh Bharat (Clean India) project. Few would have thought that nine crore toilets would be built and 4.5 lakh villages declared open defecation free in four years, he said. He launched the "cleanliness is service" exercise to push for greater public participation in one of his government's centrepiece programmes launched on October 2, 2015 and it will continue till Mahatma Gandhi's birth anniversary next month. 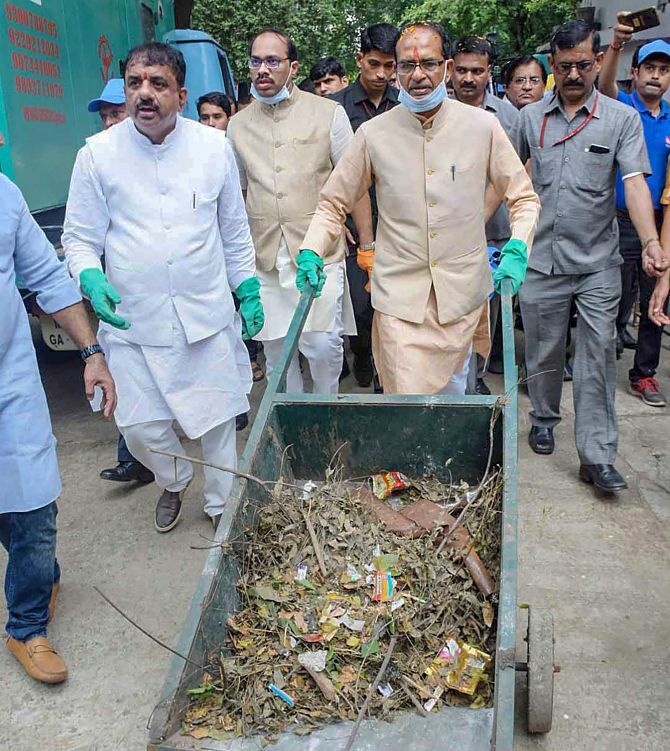 All sections of society and every part of the country have joined the cleanliness drive, he said, exhorting people to rededicate themselves to fulfilling the father of the nation's dream of a clean India. "Had anybody imagined that more than 450 districts would be open defecation free in four years or that 20 states and Union Territories would be open defecation free in four years," he said, calling it a historic day. Adityanath said Uttar Pradesh, the country's most populous and among the most poor states, would be OFD by October 2, 2018 as per a baseline survey of the clean India campaign. He said that his government is working to ensure that every family has a toilet by October 2019. His government had built over 1.36 crore toilets since it came to power last year and its emphasis on cleanliness has led to a drastic fall in vector-borne diseases, he said. Modi lauded Adityanath for his government's efforts. Cleanliness is playing an important role in improving people's living standards, he said, citing a WHO estimate that over three lakh lives would be saved by it and also a study that cases of diarrhoea would fall by over 30 per cent. Lack of cleanliness play havoc, especially in the lives of the poor, pushing them into a cesspool of diseases, he said. The prime minister spoke to people in states such as Assam, Kerala, Tamil Nadu, Bihar, Karnataka, Rajasthan and Haryana. He also interacted with Indo-Tibetan Border Police personnel involved in cleaning Pangong Lake and its surroundings in Leh, besides religious and spiritual figures, including Sadhguru Jaggi Vasudev, Sri Sri Ravi Shankar, and Mata Amritanandamayi. He also interacted with Sikh religious figures from Patna Sahib gurudwara, Muslim custodians of Ajmer Sharif and those from media group Dainik Jagran. He praised efforts of newspapers and news channels to support the Swachh Bharat campaign. 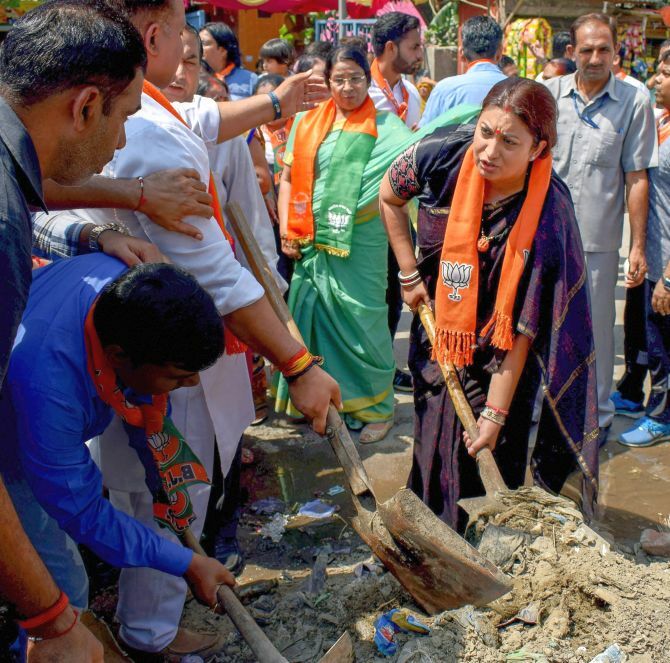 Modi said those working for the cleanliness campaign would be remembered like freedom fighters in the times to come and would be known as true heirs of Gandhi. He said his government is working for "waste to wealth" and sought contributions from everybody. The government alone cannot do it, he added. Building toilets and putting in place sanitation measures alone would not do, he said, asking people to inculcate cleaning habits in their lives. Indian culture has traditionally put an emphasis on cleanliness, he said. 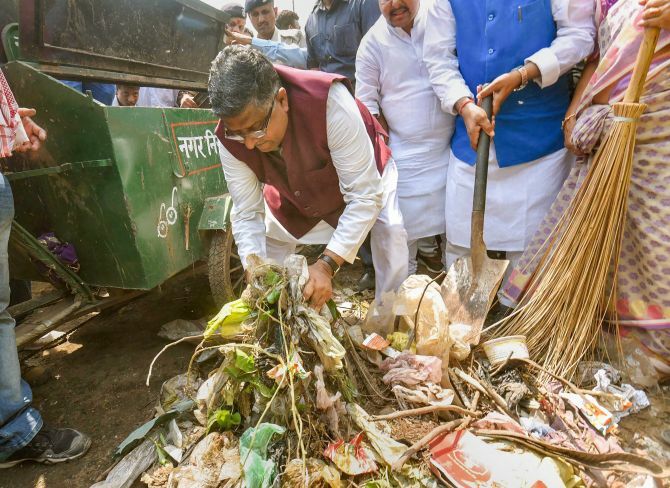 After his nearly-two-hour-long interaction, Modi took part in a cleanliness drive on the premises of Baba Saheb Ambedkar Higher Secondary School in Paharganj. Union ministers and BJP leaders and workers across the country also participated in the exercise following the prime minister's programme. 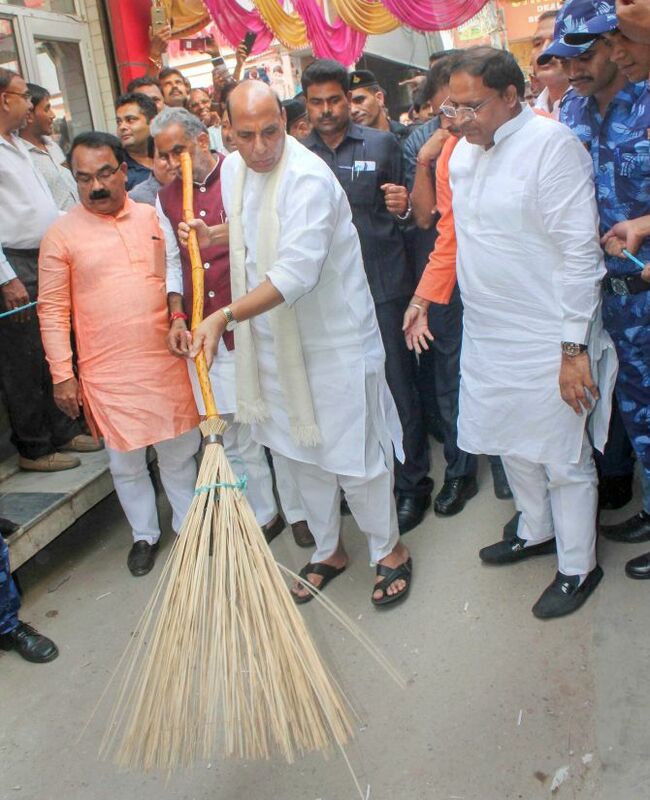 BJP president Amit Shan took part in a cleaning exercise in Telangana, Home Minister Rajnath Singh in Faridabad, Law minister Ravi Shankar Prasad in Patna among others. Modi @ 4: How 'swachh' is our Bharat?